This beautiful paper comes to us from Mexico, where where skilled artisans have been making amate paper- entirely by hand- for centuries. 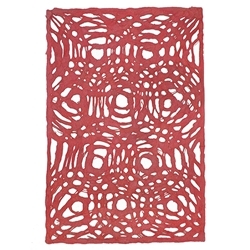 This circular pattern is a very special design, combining the centuries old technique of making amate paper with a modern design aesthetic. These sheets are suitable for framing as ready-made decorative artwork- or use them in collage, lampshades, card making, book making, assemblage, mixed media artwork, and wherever your creativity takes you.